President Obama recently sent his final budget proposal to Congress. The fiscal year (FY) 2017 budget request calls for more than $4.15 trillion to fund government operations in the next fiscal year. The budget avoids major changes to Medicaid and continues to fund Affordable Care Act-related initiatives. Notably, for children’s health, the budget continues the administration’s commitment to the Children’s Health Insurance Program (CHIP) and includes a provision to make permanent Express Lane Enrollment simplifications that allow states to use streamlined processes to enroll qualified children into Medicaid and CHIP. 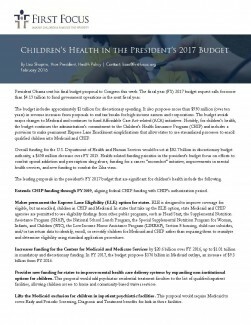 This fact sheet outlines leading proposals in the president’s FY 2017 budget, including Medicaid and CHIP, that are significant for children’s health.